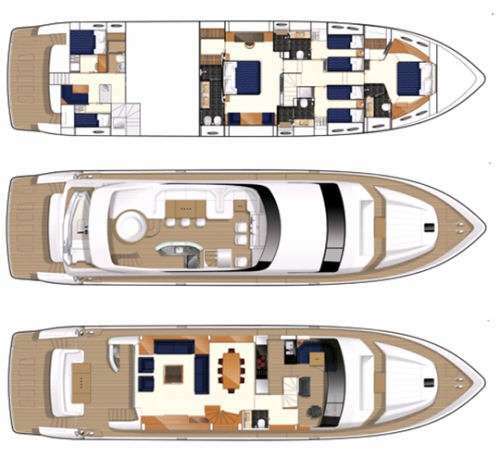 âªâª The impressive amidships full beam Master suite is flooded with natural light through large hullside windows. It features a King sized bed (1.87m width), a spacious walk-in closet, a large sofa, a vanity desk, a mini bar, Bose surround Hi-Fi system, Sat TV/DVD and an en suite bathroom, a stall shower and two sinks surrounded by marble. âªâª The VIP Cabin features a King sized bed (1.87m max width), Sat TV/DVD, HiFi system and en suite bathroom with one sink surrounded with marble. âªâª The Two almost identical Twin cabins have TV/DVD/Hi-Fi and en suite bathrooms with marbles. âª One day head on main deck.